We are done being silenced. We are ready to take action. On Saturday, March 24th, 2018, I marched for my life in Washington D.C. alongside hundreds of thousands of people who had all come together for one moment that many of us knew would become a movement. Around 9 AM that morning, I ran up the escalator stairs of the MetroCenter metro station, eager to shake off some of the adrenaline that had been pumping through my veins since the moment I stepped off the plane. Volunteers in bright neon-colored uniforms directed us towards the intersection where it would all begin. Dozens of people walked beside us on our way to the starting point of the march, all carrying the same energy of excitement and longing. Longing for change, longing for reform, and longing for the need to be heard. As I turned the corner of 12th St NW onto Pennsylvania Ave, I was greeted with the sight of people and posters everywhere accompanied by a faint silhouette of the Capitol Building in the background. I began to follow the crowd of people marching towards the Capitol, the location that would mark the end of the march. The street was bustling with people of all shapes and sizes. From toddlers to teenagers to grandparents, everyone was here in search of one thing: change. It was the first time in my life that I had ever seen anything like this. Thousands of people from all over the nation flocking to one place, disregarding differences in political parties, religion, sexuality and so much more, in order to come together as one unified, powerful, and amplified voice. This was the kind of thing I had seen on the news or read about in textbooks at school before, but now, I was here. I was a part of the march. I was a part of the change. I was a part of history and now more than ever, I knew that if we wanted real change, then it was time to take action and demand it. As we reached the end of the march, we neared a stage in front of the Capitol building designated to mark the conclusion of the march. 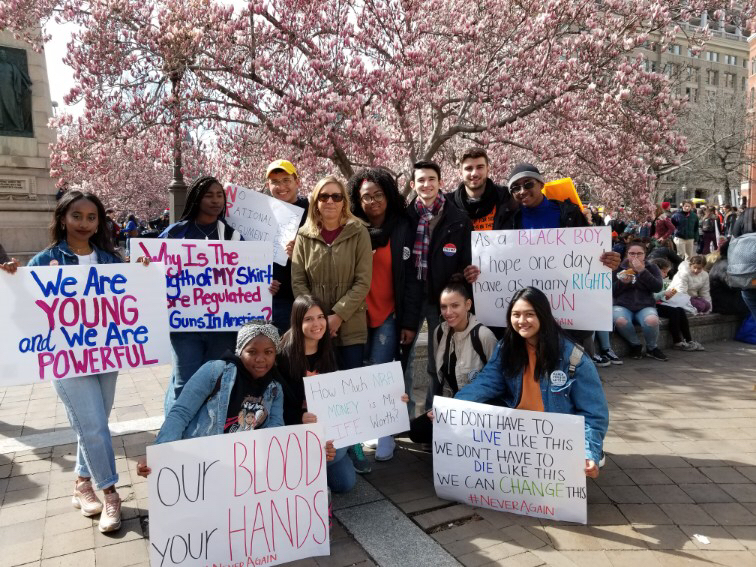 Gun violence and school shooting survivors from all over the nation spoke out against the NRA, police brutality, and gun violence in their communities and schools, all while demanding the need for gun reform in America. Gun violence survivors performed songs and poems that brought the loud, electrified crowd to tears and complete silence. I stood there teary-eyed, captivated by the very idea that a group of teenagers my age organized the entire thing. Then, I looked around and saw more teenagers around me, all with their protest signs, jumping up and down as we chanted “This is what democracy looks like.” It was inspiring and electrifying to see so many kids my age and even those younger than me demanding the attention of those who have always tried to silence us because we were “just kids” or because we “don’t know anything about politics.” We will no longer be silenced by those who think that we are incapable of complex thinking simply because we are under 18, nor will we be silenced by those who try to discredit our experiences because we are kids. We know what is going on and we seem to realize it much quicker than many adults do. There’s a million things we haven’t done, but just you wait. Roars of determination filled the streets. Not a single man, woman, or child looked anything less than commanding. They were the pieces to a forgotten puzzle. Each and every one of them believed in something greater than themselves. Believed in the lives of the people around them. Believed in the protection and security of our nation as a whole. Believed in their right to free speech. They stood together, people from all over the nation from coast to coast. I was in absolute awe. Never had I experienced such a moment in my life like the one set before my eyes. I couldn’t help but smile until my cheeks hurt, and pinch my arm until I believed that I was really there. And when I had the chance to fully take in the space around me, I wanted to cry. Because we were here. Because we had made it. Because no matter what they had told us, we weren’t going to let another tragedy occur on our watch. Now, I don’t claim to know a lot about politics. I do know though that the severe gun issue we have in this country, should not be a political issue. It’s not about anything other than protecting and saving the lives of the people in this country. On Saturday, March 24, we marched with people who wanted nothing less than to protect their future. We cried in anguish for the ones who had lost their lives to a senseless bullet and screamed in frustration until the whole city could hear nothing but our voices. Speaker after speaker claimed the stage as their own, and left the audience feeling more empowered as time went on. No one had ever imagined that a group of high-school kids from Florida would ever create an impact like the one they have so beautifully created. I have never been personally affected by gun violence, but you don’t have to be to know that it should never happen. The tragedy itself should be enough. Columbine, Sandy Hook, the Pulse Night Club, and the Las Vegas shooting, should have been enough. And so, I stood there beside strangers, in shivering temperatures, and my hands numb from holding my poster above my head. I stood there with pride, and thought that maybe, just maybe, we could be the tipping point. Ever since the Parkland shooting took place, I knew for a fact that I wanted to be able to do something that would cause a change. When the March for Our Lives was announced, I made it a point to be able to go to D.C. to participate in an event that meant the world to my peers and myself. The day before the march, a few friends and I went to the Shake Shack in Union Station to take part in their “poster-making party,” where people from all over the country could gather and use provided materials to make posters that they could use in the March the next day. Even though we were one of the first people to arrive, after a while, the room was hustling and bustling with individuals who wanted to cause change, just like us. The most beautiful thing was that there were people from all different backgrounds and ages coming together to foster the growth of something that they so desperately believed in – something we all so desperately believe in. To see the amount of positive encouragement that flooded the room was simply contagious, which led us all to want to be able to make the best posters we possibly could. The next day, on the day of the March, my sister and I decided to go earlier to try and beat the crowd, as we knew (and hoped) that a lot of people would show up. Well, that was an understatement. I had received news that the March had turned into a rally, and I assumed it was because of the sheer number of people that had shown up. The March was supposed to start at 12 pm, and even though we got there at around 10 am, the amount of people there was absolutely unreal. Everyone was somewhat tightly packed together, each one of us armed with our signs and our voices, ready to rally for change. It was truly enlightening. There were people who incorporated popular memes into their posters, clever wordplay, and impeccable drawings, but those weren’t the things that stood out to me most. What I appreciated and loved most was that, during the entire event, there was a vibe of such strong love and passion for what we wanted. There was no hatred. My sister pointed out that most, if not all, Trump-related events always incorporated violently attacking their opposing groups and, although we publicly displayed how we did not agree with the pro-gun legislation in our country, we never harbored any feelings of malice at all. During the speeches, we were filled with motivation and encouragement. All the guest speakers filled the crowd with such enthusiasm and hope for a better future; things we desperately needed.